Serenity Now: Mississippi Mud Giveaway! Happy Thursday, friends! My twenty-fauxth birthday was lovely, thank you...more about that another time. I introduced you to Sarah from the Mississippi Mud Etsy shop recently. 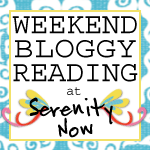 Sarah had so much fun that she wanted to come back and offer a fabulous and very generous Giveaway to Serenity Now readers! OR a $30 credit to the Mississippi Mud shop! The great thing about the Baby Momma necklace is that it is so versatile. You don't have to be a "Baby Momma" to wear one...just a chic chick of any age or stage in life who likes to look cute. *Real* people can wear this necklace. See? There are several ways you can enter. If you linked up to my latest Decorating Dilemmas Party, you automatically have an extra entry! If you are just too excited about these beautiful pieces to wait for the winner to be announced, the Baby Momma Necklaces are on sale for $15.95 until May 1st. Head over to Mississippi Mud to get yours today! 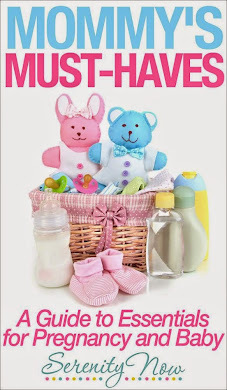 Mother's Day is coming up soon and if your husband is a terrible gift giver needs some helpful hints, you could email him a link to your favorite item. Is it wrong of me to want to enter my own Giveaway?? I liked the chocolate brown baby momma necklace, the copper collection earrings and there was a matching earring/baby momma necklace set I liked too! Good morning from SITS today! I checked out Baby Momma and I love the black and silver bangle bracelets. I also really think those crocheted wire necklace and bracelets are pretty awesome. Thanks for posting this! Such a fantastic giveaway! I love the beaded bangle bracelet in black and silver. Too pretty! :) I love the Gnarled Nest items in gold & also the navy baby momma necklace! Even if I don't win I'll have to mark those on my wishlist!! And a very Happy Birthday (one day belated!) to you, Friend!!! :) Hope it was a fabulous one! My fav are the sopisticated snowflake earrings. So unique! I like the bangle bracelets. I am a follower and love visiting your blog!!! 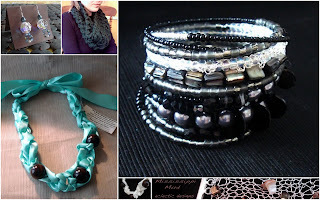 I really like the Lacey Links - Crochet Ribbon Necklace in Black! I like the beaded bangles, but I can't decide between black and one of the bold colors! Thanks for the chance to win, and belated Happy Birthday! Did you recover from your mocha yet? Shades of Taupe and Pearl Bracelet!! I'm following Mississippi Mud now too! I think I like the beaded bangles best (try saying that three times fast!). Her shop is really cute, and I'm sure she's thrilled to have you highlight her wares! But, yeah, it's probably not right for you to enter your own giveaway. Shucks. I'm so glad you had a good birthday; I look forward to hearing more about it. I like the earrings, especially the Sophisticated Lemon Drop Earrings. I love the mohito mint earrings. Hello sweet Amanda - What a fun giveaway! I enjoyed visiting Sarah's shop! My fave is her Gnarled Nest pieces. So pretty! Thank you for the chance to win. Hello sweet Amanda - I am now a happy follower of Sarah's blog! Hello sweet Amanada - I Tweeted about your fabulous giveaway! I do love the Baby Momma necklace, but I also love the Crochet Ribbon Necklace - Magical Magenta. It is beautiful! I loooooooove the sophisticated snowflake earrings! So darn pretty! I love the Beaded Bangle in shades of pearl. I love the chocolate brown baby momma necklace! I love the bubble gum pink one! I like the black and silver beaded bangle! Love the chocolate brown necklace...also the knitted wire cuff. I like the gnarled wire bracelet. I think is what it was called. I tried to post the link here, but it wouldn't let me. Already a MM fan on FB! LOVE her stuff! Ooooooh! I LOVE the Gnarled Nest in Gold!!! So intricate and pretty!!! Now I'm following her blog!! Thanks for such a great giveaway! I just became a fan on her Facebook page! Thanks so much! I just tweeted about this giveaway! My Twitter name is also Jen5253. Thanks so much! I LOOOVE the teal Baby Momma necklace witht he brown beads. GORGEOUS! I am now a follower of Mississippi Mud's blog. I am a fan of Mississippi Mud on Facebook! I love the beaded bangle- golden sun. SO CUTE! 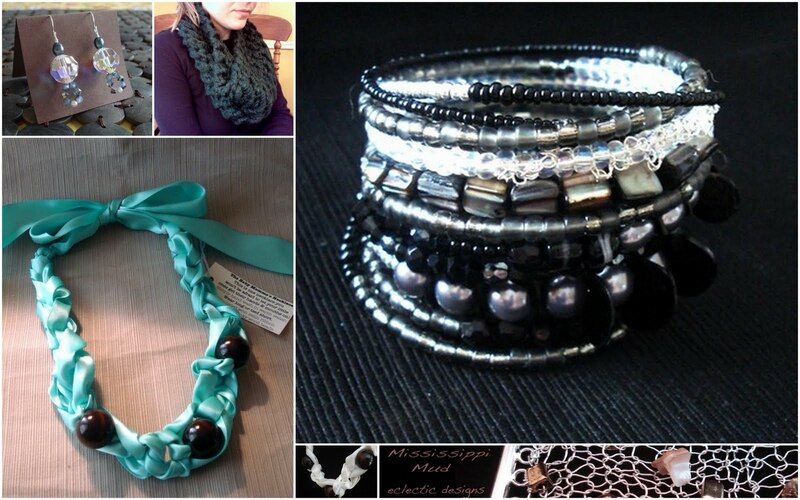 I have three favorites: the beaded bangles in black/silver, the beaded bangles in shades of pearl, and the handknit cowls! So pretty! I like the Crochet Wire Collection - Copper Pearls Duo. I kept changing my mind when looking through her shop! I definitely love the shades of pearl beaded bangle the best though! I am a follower of hers now! I love the gnarled nest or anything with pearls - a favorite! So glad you found her for us. Everything is a keeper! 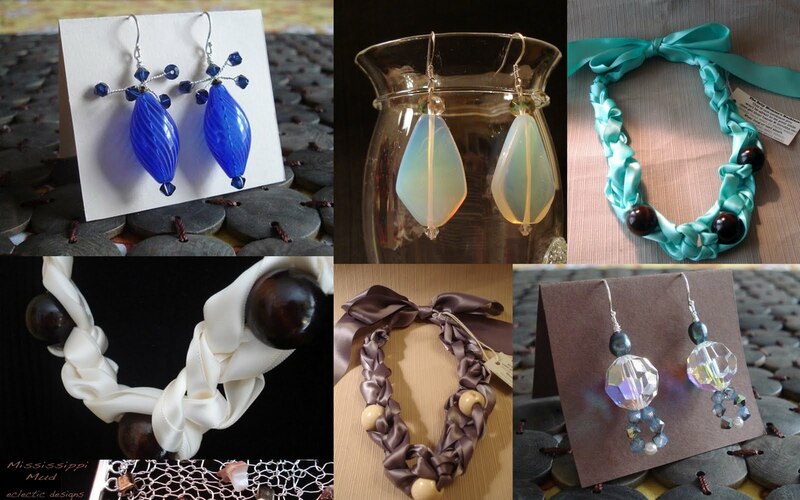 I love the Frozen Tear Drop Earrings. They're of whacky and pretty. Perfect. Love the names of her pieces, too. i would love to have the baby momma necklace in yellow and the sophisticated snowflake earrings. they are awesome! Baby Momma - Crochet Ribbon Necklace - Teal is my fave! I adore her designs and I love the jewelry but I'm drawn to the handknit cowls though. Plum or Army/Olive. My favorite is the Shades of Blue - Bracelet! I'm following the Mississippi Mud Blog!